ROAD: Berlin offered up a surprise winner, three sub-2:19s and a slew of PBs as GB and Japanese athlete make storming debuts and some USA and Canadian athletes made good on their pre-race aims. ROAD: Berlin, Oslo etc. post to follow soon! Full BMW Berlin Marathon preview here. The 100-kilometer course begins with one 2.5km out-and-back, and then launches into 13 repetitions of a 7.5km out-and-back route to compose those 100kms. The course has some hills, is entirely asphalt pavement, and travels in and out of the small tourist and agricultural village of Sveti Martin and through both a forested area as well as open farmlands. Each out-and-back has one 180-degree turn and something like ten 90-degree turns. September climate in northern Croatia sees average highs around 22 degrees Celsius/70 Fahrenheit, and lows around 10C/50F. Humidity ranges in the moderate to very high, depending on local weather systems. Susan Harrison has a shiny 100km PR of 7:39 which she set in taking 10th at the 2015 100km WCs. If you take it back to 2010, you’ll find her 50km PR of 3:15, which I believe is also a British national record. Also, I believe 3:15 is the fastest 50km PR in the field, and Harrison shares this PR with USA’s Emily Torrence. Samantha Amend has run at least 3:30 for 50km and 7:53 for 100km, both in 2018. She took seventh at the 2016 50km WCs in 3:35. She’s also run 16 hours for 100 miles at the 2016 Thames Path 100 Mile, which is the course record there. Head is out of clouds and feet back on sea level, it is time for that very delayed report from the Glastonbury of Ultra Trails; UTMB week. For seven days over the last week of August the international trail elite fight with every runner with a pair of inov8's in their shoe closet for a table at one of the vast amount of eateries in the town of Chamonix. It is the time of the year when your local nature nerd gets to shred the same mud as the worlds best runners over four stunning but brutal courses on and around the Mont Blanc Massive. It's basically heaven on earth. The competitive part of the week began on Wednesday morning with the start of the most technical of the four races. TDS or; 'Sur les Traces des Ducs de Savoie' as the natives and those with a higher grade in French than me call it steers of the main path of Trail de Mont Blanc and runs over less trodden terrain with steeper climbs up to high altitude. Where as the other 3 races runs up and down between villages in the valleys the route of TDS takes the runners far from civilisation and at points they have to travel nearly 20 k between aid stations. Due to a weather forecast of high humidity possibly leading to Thunder Storms the race organisers made a decision to skip one of the most exposed part of the route and to delay the start by two hours. This did not mean that the runners lining up in Courmayeur had a shorter route to tackle, the new section lapping around the Col de la Forclaz added an extra 5 km to the original 121 km course. Much in line with my race predictions from last week we saw Kathrin Gotz from Switzerland start out fast and she was running strong over the first long climb to Col Chavannes but by the 50 k mark at Bourg Saint-Maurice the course had taken its toll on her and she dropped out citing stomach issues as the reason. Gotz has had a race-heavy season to say the least and having been out on the course myself i can guarantee that its one you want to enter with legs and mind as fresh as they can be. Another favourite who probably came into TDS with her pins in pieces was recent (as of two weeks …)Pikes Peak champion Megan Kimmel, she was up with the front runners for the early miles of the race but started to slip back the field after the 50 k mark in Bourg St. Maurice. In other words the predicted Gotz vs Kimmel battle for the win did not happen and instead we got to witness a race between multiple UTMB winner Rory Bosio and home girl Audrey Tanguy. The two took turns to run in front for most parts of the race but in the end Tanguy managed to push away from Bosio and got a sweet revenge on her two second rankings from earlier in the year by running into Chamonix as first lady 14 minutes ahead of Rory in 16:05. Behind the dynamic duo at the top there was a bit of a gap down to third lady and second French-ette Caroline Benoit who after a conservative start made her way up the field and finished in 17:18. Out of the British contingent Natalie White was the speediest lass home finishing 13th in 20:04:35 just four minutes behind the previously mentioned Megan Kimmel. … Natalie is a new name for me but after some ITRA-stalking I learned that she's been doing some solid racing on the international trails over the past three years. 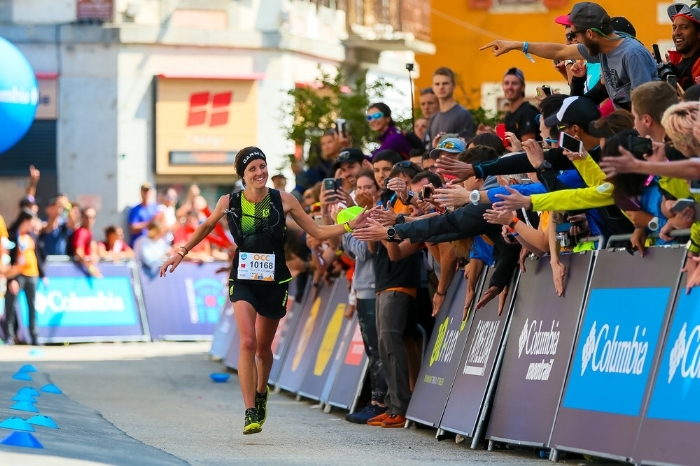 She placed 25th in a competitive field at Lavaredo Ultra Trail in June and 4th at OCC back in 2016. Whilst the TDS mid packers crossed the finish line in Chamonix the runners of the shortest race during UTMB week were just getting ready to begin their journey. Starting from the quaint Swizz mountain village of Orsiere the course of OCC soon joins up with the last 50 k of the mother race (including a beastly climb up to Les Tseppes at ) before it ends on a long descent into town from La Flegere. In contrast to the other races where the runners need to conserve their energy for a long day (and night) on the trails this is a fast and furious one. With that in mind it was no surprise to see my pre race favourite and this years Marathon Du Mont Blanc winner Ruth Croft drop the hammer from the gun and with strong Spanish runner Eli Gordon hot on her heels she had every reason not to slow down. Croft finished the race just as she started by sprinting into town as first lady and 18th OA in an impressive time of 05:53:09. Gordon finished 7 minutes behind her and after that it was just as in TDS a bit of a wait to round up the podium. Third lady to Cham was this years winner of the 64 k course at Transgrancanaria; Monica Vives from Spain. GB's Gemma Carter (winner of this years Country To Capital) had a great day in the mountains and came in as 16th female 1.24 behind Ruth Croft. That is a very impressive alpine race result for a London based runner! Over the last couple of years CCC has lost a bit of significance against the more gnarly course of TDS. It still attracts a good bunch of top notch runners though and it also has a habit of introducing us to new names on the European trail circuit (Mimmi Kotka won it in 2016 and Clare Gallagher in 2017). Just as OCC it follows the later stages of the main UTMB course, starting from the Italian side of Mont Blanc in Courmayeur it leads the runners up up up to Refuge Bonatti before they hit a runnable traverse into Switzerland where some painful climbing into French territory begins. 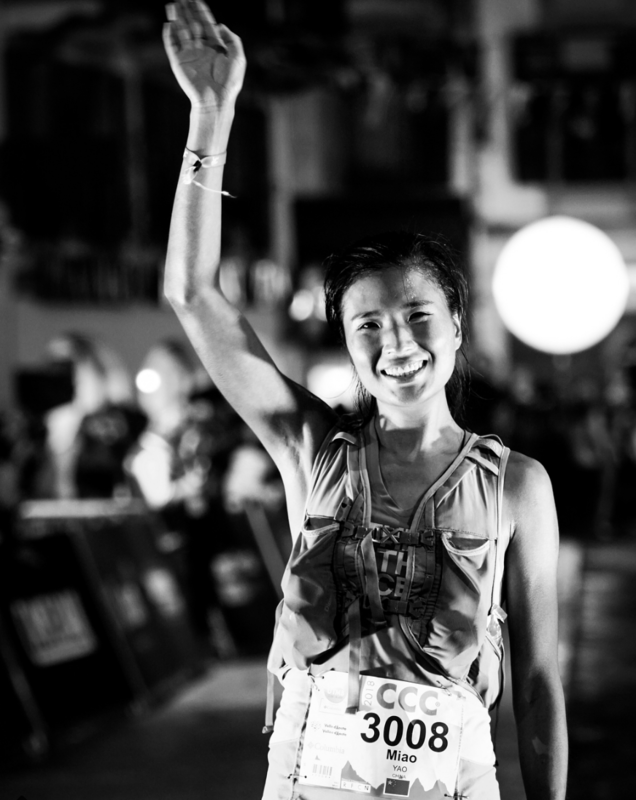 Young Chinese runner Miao Yao stepped into the trail lime light when she won and crushed the course record at the Hong Kong 100 in the beginning of the year. A run she followed up by coming second behind Kelly Wolf at Lavaredo Ultra Trail early in the summer and last Friday she showed what an amazing runner she is by smashing up the field at CCC and coming in not only as first woman but as 11 OA (and the male competition was serious this year with a really tight race between the top 3). It will be interesting to see how she develops and I hope we will see her coming back for the big one a couple of years down the line. There was no one to threaten Miao at the top but half an hour behind her a tight race was unfolding between American Katie Schide and Sweden's Ida Nilsson. Both runners with a record of strong racing over mid ultra distance, Katie won both the 84 k version of Madeira Ultra Trail and Maxi Race this year and Ida is the 2018 champion of Zegama and placed second at Marathon Du Mont Blanc. The two of them were running very close to each other throughout the race with the American just slightly ahead of the Swede and it was only at the very end that Schide managed to pull away and take home the silver half an hour behind Miao Yao and 13 minutes ahead of Nilsson. Top UK runner in this years CCC was the West Highland Fling winner Nicola Adams-Hendry who came in as 17th lady with a very respectable finishing time of just under 16 hours. Where to begin with the main race of UTMB 2018. It was a weird one. All week it looked like the weather was going to be amazing and there was an excited whisper around town of course records being broken. But by Friday afternoon clouds had started to form in the sky and the race organisers made a last minute decision to ask runners to add the extreme weather gear to their already rather lengthy mandatory kit lists. As the runners set off down the streets of Chamonix to start their extensive lap around the Mont Blanc Massive the rain was pouring down.Then suddenly it stopped and so did the race for so many of the athletes at the top of the ranking lists. One after one the mighty came falling. An allergic reaction here, a rock slide there, the rescue helicopters were in shuttle traffic transporting elite runners from the summits down to the town of DNF's. The first big drop from the womens field came already at Les Contamines just 30 k in where my pre race favourite Mimmi Kotka took off her Salomons and left the race. At this point Magdalena Boulet was running in the front with Caroline Chaverot and then a big chasing pack including americans Clare Gallagher and Amy Sproston and Spains Uxue Fraile. Out of those 5 only one would last to the finish line. After moving at serious speed for the first 40 k Boulet suddenly dropped at Lac Combal at 65 k, she was closely followed by Amy Sproston and in Courmayeure it was time for Gallagher to call it quits. With the three big american challengers out of the race Caroline Chaverot powered on through the Italian night with quiet a big gap down to the next runner. From here it was a bit confusing to follow what was happening, runners charged and then dropped out, the only one constantly racing in a top 10 position was the previously mentioned Uxue Fraile. Chaverot disappeared after what looked like a strong climb up to Col Ferret to not be seen again and it was somewhere around here at the 100 k mark that women who had started their race running far from top ten began to move into podium positions. It also became a lot more of a close race between the veterans in the front. Francesca Canepa hailing from the Italian side of the massif came into the 135 k check point as the leader of the ladies race having climbed up the field from a tenth place at Courmayeur. She maintained the lead from there onwards but her victory was never set in stone as behind her Uxue Fraile was chasing and she in her turn was not far ahead of home girl Jocelyne Pauly who after lingering in top 10 for a large part of the race pushed into top 3 over the last climb. Another runner with a very strong finish was GB shero Beth Pascall who started the final 25 k as seventh lady but forged ahead and moved up to 4th by the last aid station in Flegere. To the very last minute it looked like she might make it to beat Pauly to the podium. Behind her Italy's Katia Fori rounded up the top 5. All in all it was less than 90 minutes between the first and 10th lady. That is one tight 170 km race! Outside of the top 5 there were some more impressive UK performances. The rock that is Sophie Grant came in as 12th lady in 27:51 followed by Jo Meek in 19th. Holly Rush struggled with digestion (listen to her marathon talk feature in this weeks episode, it is hilarious!) but still bagged 21st place. Behind her in the rankings we find Amelia Watts in 22nd, Carrie Craig in 24th and Debbie Martin Consani in 25th. Amazing work from team GB in a race which saw so many strong runners be beaten by the forces of mountains and mother nature. Maybe a diet of crumpets and mud aint to bad after all …. Friday 7th sees the start of the gruelling Tahoe 200 and i'll eat my Ciele Cap if Courtney Dauwalter does not take home the win for a second year in a row. I mean she will probably beat all the guys again too. Back in the alps the almighty Nikki Spinks is lining up for the Ultra Tour Monte Rosa which in many ways is very similar to UTMB and on home turf it is time for the Thames Path Challenge 100. Each week Cajsa and I bring you the news from the roads and the trails. If you have any races your want covered or running-women you want applauded just let us know. Scroll down to find all the results from the weekend just gone and some previews for those ahead. Just north of Auckland on North Island NZ is the North Shore Marathon. An out and back along the coast I can only imagine that it is a truly beautiful run. First place and an impressive 2nd overall went to Kate Loye, rather a step up from her performance last year as 6th female and 55th overall, though it was a slower time this year. If my cyberstalking is correct, Kate is not just a good runner - she's represented NZ in Under17, Under 20 and Senior women's football. It looks like she was taking it pretty easy given that she finished the Rotura Marathon in 2:58:28 in May of this year. 41 year old Croatian Marija Vrajic (I hate that the age is interesting, but it is) who is also an ultramarathoner (she won Bronze in the World 100k Championships in 2015) won this hilly swiss marathon. Her PB was set in 2016 as 2:40:41 and she's still on great form, having run 2:56:00 at Randenci Marathon in Slovenia in May followed by 3:05:15 at her local Plitvice Lakes Marathon (coming 4th) but she comfortably won this race in a somewhat tantalising 3:00:47.
and then it's Berlin on the 16th! !